@Gackt: I'm not sure but maybe you are missing something here.. Not sure if you fully understand what is going here..
@tomhoward379: Don't see any Sick responses, probably because they blocked me when I made an enquiry about demo bikes (didn't get any response to the query unfortunately). Wonder and would like to know how many people actually bought a Bike of sick? Just in case they were referring to the frame then technically it has been over a year. They should check the last email they sent to me. Sad,... When all of this is going on all you hear is that they defend themselves by saying that no one has waited for a product a year... Clearly missing something more important here. @HurricaneCycles: That is absolutely understandable. In many these cases customers were extremely patient and tolerant I've no doubt. A lot of people waited for many many months. Customers should not soak up suppliers issues and, as you said, no excuses should be made. @PHILXX1975: They refer to a "hub" being their distribution point either their bedroom, tatoo parlour or a new place they've moved to. It's where the goods are packed and shipped to some customers. So, according to Jordan the frame I ordered was in their hub for about 3 months. Could still be there there, who knows, I stopped asking about it. 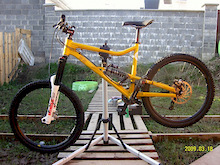 According to James (Cs) the frame in its final QC and getting ready to be shipped to them (the hub) from very far east. ..I really don't know what is going on..
@woffa04: This is what baffles me.. How can you say to a customer, sorry lie, that something is in the box ready to go knowing it isn't. I've asked Jordan about my frame numerous times over IG live feed and he told me it's in the hub ready to go very soon. That went on for months. Same bs as here really. Luckily, you've paid through PayPal, so they were very kind to take time and respond you as couldn't take another PayPal claim. This is Insane! Just makes you angry knowing they still trading after ripping so many people off! Playing with people's emotions on their IG with never-ending "sorry" and "thank you". @jonathansixtysix:.. Remember well.. They were young, arrogant and naive.. but life thought them pretty quickly.. They've piled so much sh**t on their heads that soon realised they gonna have to start swimming or they'll sink very quickly. Recent IG post: "... We've always been about the rider, now we want to make sure we can take care of our customers. We're one big family. Thank you for your trust..." "... An unusual side effect of this weekend has been how determined it's made me to do better, to grow and to make things better. " .. What do you make of this?.. How do you think it makes ripped off people feel?! You Took Their Money! Hard Earnd Money! Coward. Wonder if sick were giving out customer refunds at the show to screwed up people they robbed! Scammers!